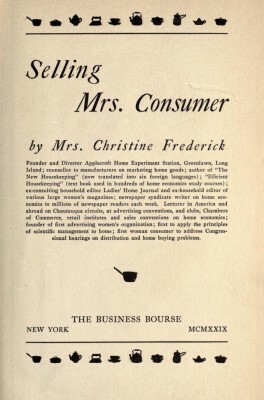 Selling Mrs. Consumer, by Christine Frederick, 1929. Internet Archive. 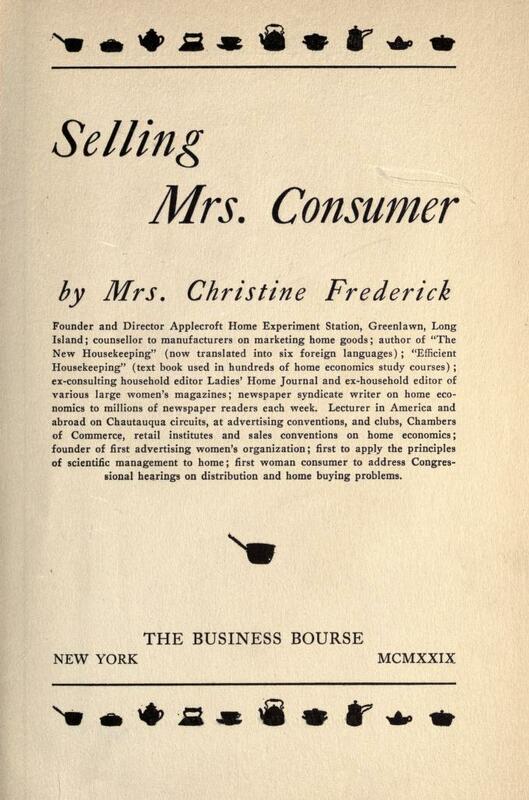 In 1929, home economist Christine Frederick wrote that Henry Ford had been “brought to his knees by Mrs. Consumer,” whose purchasing power companies should ignore at their peril. Ford, who famously said his customers “could have any color [car] so long as it is black,” had ignored women’s desire for a variety of colors. Companies such as Chrysler and GM filled the gap. Ford was just one example according to Frederick of how companies must take an X-ray of the customer if they want to sell products. That same year, a young home economics teacher from Mansfield State College approached Corning Glass Works with a proposal to provide an X-ray of the Pyrex customer. Lucy Maltby, a Corning native, was also convinced that companies were ignoring customer needs. She had ideas about how Corning Glass Works could improve its sales by making better Pyrex products and marketing the features that were of most value to customers. Corning executives listened to Maltby’s ideas and soon after, Maltby became Corning’s first director of home economics. Within two years Maltby established Corning’s Test Kitchen and had hired additional home economists to run the kitchen and provide training programs for sales staff. 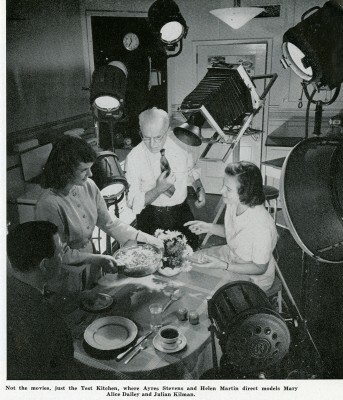 Maltby saw the Test Kitchen as a place not only to test products, but also as a showplace for photography shoots, and later, televised demonstrations of cooking with Pyrex. 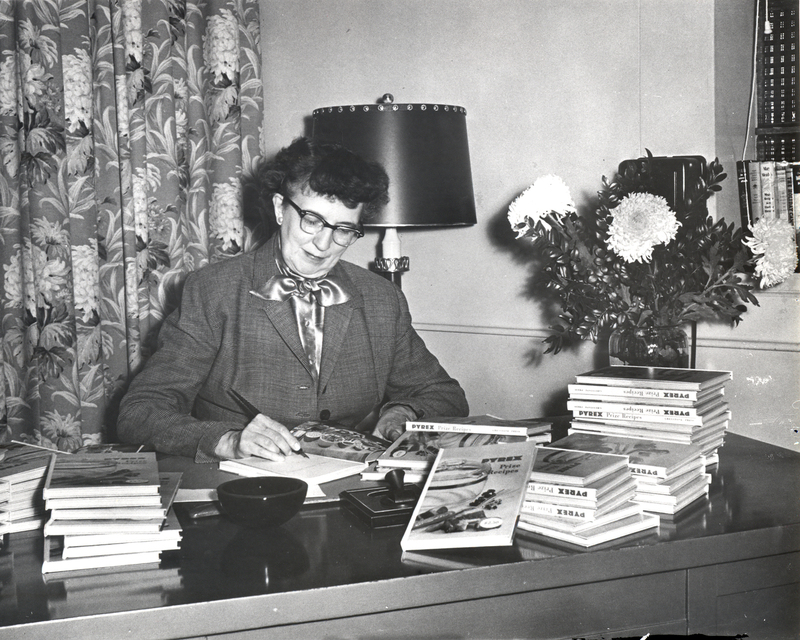 Lucy Maltby signing copies of her cookbook, Pyrex Prize Recipes, 1953. Courtesy of Corning Incorporated, Department of Archives and Record Management CMGL 144704. Maltby created a far-reaching program that went beyond testing products, writing recipes and corresponding with customers. 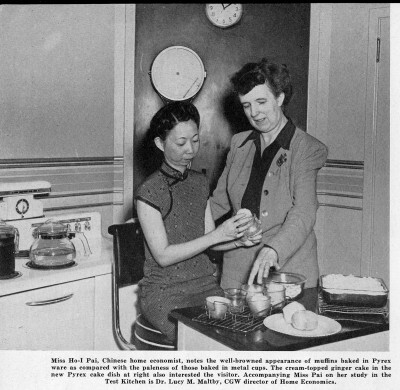 Her staff supplied other companies, food editors, newspapers, photographers, and syndicates with Pyrex dishes to use as props as well as photographs of food to use in articles and editorials. She estimated, in one week, her department’s network created publicity for Pyrex products worth over $160,000 in magazines and newspapers alone. By the time CorningWare was introduced in 1958, checking in with the customer had become a veritable science at Corning Glass Works, as evidenced in a promotional film, American Women…Partners in Research (from the Internet Archive). In the film, Chet Huntley narrates the story of how everyday women work with Corning to develop new products, like coffee percolators, for the market. The market research he describes was the product of years of work by Lucy Maltby, pioneer home economist, marketing professional, and advocate for Mrs. Consumer. Advertisement for a cooking demonstration. Binghamton Press, April 21, 1936. Courtesy of Old Fulton NY Post Card Website.